This is no diner, drive-in, nor dive. Guy Fieri's newest trip to "flavortown" is at Foxwoods Resort Casino at the brand new Guy Fieri's Foxwoods Kitchen + Bar, which opened on Friday. "This is going to be the Guy Fieri-style. 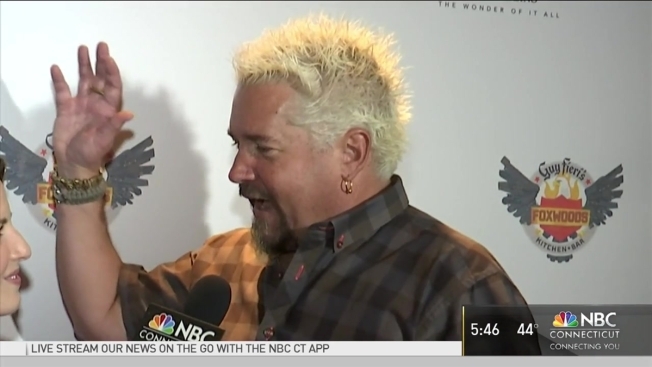 So we're going to have a eclectic food, scratch made food, lots of flavor," Fieri told NBC Connecticut. NBC Connecticut spoke with him last month about why he chose southeastern Connecticut as a destination. "I've come here and cooked as a chef, there's been some fantastic food and wine festivals here. But my wife's family is from North Providence, I got a bunch of cousins down in Boston, so this is a place to come. This is going to be a great destination for our family," he said. Those at the restaurant on day one said they're happy it's here. "Something new in Connecticut with national reputation is great," said Carole Wagner of Hartford. "It's pretty cool. I've watched all of his shows and it's interesting to see that he's bringing some of that food," said Lorenzo Gallo of Westerly, Rhode Island. From a tatted-up turkey burger to chicken fried chicken to sashimi won-tacos, when you see this menu, you'll understand why. "Brussels sprouts, sweet potatoes and pickled onions doesn't sound like it would be too appetizing but it's fabulous," laughed Linda Curry of Mystic. Fieri said there are some special items for this Foxwoods restaurant that customers won't find anywhere else, including his other restaurants across the country.